At the morning service on 19th January, Inveraray Church was rededicated after the refurbishment of the walls and roof. Rev Louis Bezuidenhout, the Minister of West Lochfyneside, spoke in his sermon of the parallels between King Solomon’s temple and Inveraray church. The church had originally been designed to have a similar footprint to the first temple in Jerusalem. 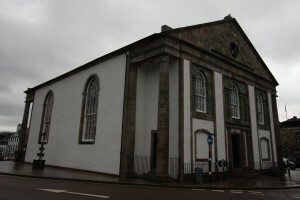 Just as Solomon’s temple was the focus not only of worship, but of the whole life of the community, so in Inveraray the church is at the heart of the town, and its mission is always to be the heart of the community. After the sermon, Rev Brian Wilkinson, former Minister of the church, prayed a prayer of rededication of the church and its congregation. At the excellent lunch after the service, the congregation said goodbye to Rev Louis Bezuidenhout, as it was his last Sunday in the church. Mr Bezuidenhout will be inducted to the charge of Alves & Burghead linked with Kinloss & Findhorn, in the Presbytery of Moray, on Friday 31st January. At both the service and the lunch, much appreciation was expressed for the work of the contractors, LTM Group, the architect, Martin Haddlington, and all those involved in the work.